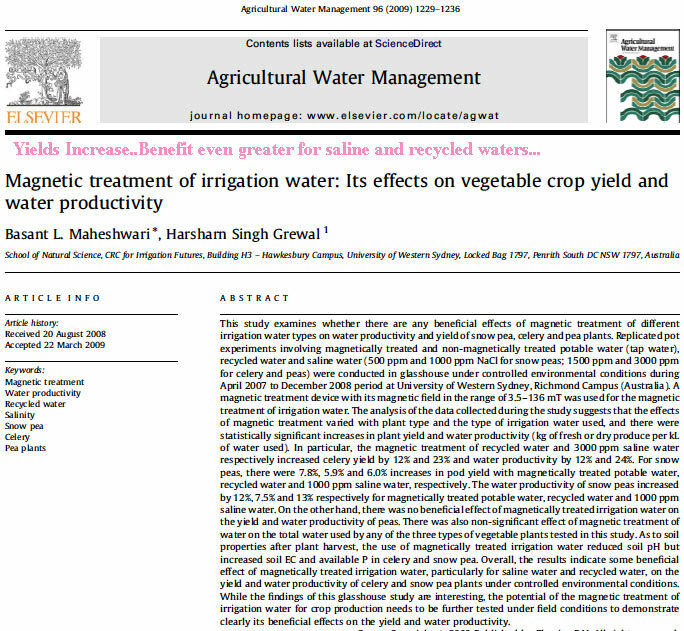 Every academic study done on magnetic water treatment for agriculture has shown dramatic results. Magnetic water (MW) is water that has been passed through a magnetic field. Magnetic water treatment devices (MTDs) or magnetic water softeners are environmentally friendly, with low installation costs and no energy requirements. MW can be used to increase crop yield, induce seed germination and benefit the health of livestock. MW treatment is currently used in Australia, Bulgaria, China, England, Japan, Poland, Portugal, Russia, Turkey and the United States for these purposes (Qados and Hozyan, 2010 and Hozayn and Qados, 2010). It is believed that magnetized water used for irrigation can improve water productivity (Duarte Diaz et al., 1997), thus conserving water supplies for the expected future global water scarcity. MW has also been found to be effective at preventing and removing scale deposits in pipes and water containing structures. Magnetized water also can increase the levels of CO2 and H+ in soils comparable to the addition of fertilizers. Cleaning agents have an increased effectiveness when combined with the power of MW, and the amount of cleaner used can be reduced by one-third to one-fourth (Kronenberg, 1993). Natural water contains micro and macroparticles of organic and inorganic natures along with different ions, zoo- and phytoplankton, and microbubbles (Bogatin et al., 1999). Magnetic water treatment is based on the principle of “magnetohydrodynamics”, where; electrical energy is added to charged particles in water that contains ions and small solid particles with electrostatic charges by a magnetic field. The energy is produced by the momentum of the particles and remains attached to the particles as surface energy (Gehr et al., 1995). Magnetic water treatment works on the principle that as water passes through a magnetic water softener, a Lorentz force is exerted on each ion which is in the opposite direction of each other. The redirection of the particles increases the frequency of collisions between ions of opposite sides, combining to form a mineral precipitate or insoluble compound (Gholizadeh et al., 2008). Calcium carbonate precipitates out of solution as a sludge and can be easily removed from the system since it will not adhere to pipe walls. Figure 1. Configuration of ionic particles in a magnetic field (Gholizadeh et al., 2008). The application of a magnetic field to natural water can enhance degassing by 25-30%, caused by local dehydration of surface microbubble films and a decrease in pressure in the center of vortices resulting in an increase in free gas bubbles that can then be released into the open air (Bogatin et al., 1999). This degassing increases permeability in soil, resulting in an increase in irrigation efficiency. When a magnetic field is applied to water the molecular structure becomes more stable and the ability to form hydrogen bonds is enhanced. Magnetizing water can increase the number of hydrogen bonds by 0.34% (Chang & Weng, 2006). In the same study, the researchers verified results of decreased surface tension and increased viscosity with the application of a magnetic field on water. Applying a magnetic field to natural water causes a redistribution of flow energy because of a momentum change of charged particles. All the particles and ions are electrically charged such that when magnetic fields are introduced convection and induced currents cause the liquid to spin. This movement then effects changes in gas content and the amount of salt crystallization centers in the water (Sherkliff, 1965). The quick change of the magnetic field in a properly designed magnetic water softener loosens hydrate layers and films in a moving liquid, thus enabling coagulation and coalescence (Bogatin et al., 1999). McMahon (2009) summarizes that in order for water to be properly treated magnets should have a strength reading of approximately 3000 Gauss, the solution should be passed through the device more than three times, that all piping should be steel, copper or PVC II and the orientation of the magnets should be alternating. Magnetic treatment of saline irrigation water can be used as an effective method for soil desalinization. The application of a magnetic field on water decreases the hydration of salt ions and colloids, having a positive effect on salt solubility, accelerated coagulation and salt crystallization (Hilal and Hilal, 2000). Field experiments conducted in Egypt showed that, sandy loam soil pots irrigated with normal highly saline water of an electrical conductivity value of 8.2 mmohs/cm retained salts compared to pots irrigated with magnetized saline water (Hilal and Hilal, 2000). The study showed that MW increased leaching of excess soluble salts, lowered soil alkalinity and dissolved slightly soluble salts (Hilal and Hilal, 2000). Joshi and Kamat (1966) and Busch et al. (1985) have observed pH changes with the application of a magnetic field to water. Parsons et al. (1997) confirmed a decrease in pH in a study using sodium hydroxide to stabilize pH at 8.5 then applying magnetic treatment to the solution. In this study, the magnetically treated water required up to 2.5 times more sodium hydroxide compared to the controls to stabilize pH. pH has been shown to decrease from 9.2 to 8.5 after magnetic treatment in a system with Ca(OH)2 (Ellingsen and Kristiansen, 1979), where the degree of the reduction was dependent on the strength of the magnetic treatment. Busch et al. (1985) showed an initial decrease in pH from 7.0 to 6.5, that was followed by an increase in pH with time from 7.5 – 8.0. Figure 2. The effect of magnetism on the pH of water (Parsons et al., 1997). Water becomes degassed in the process of being magnetized and this degassing increases soil permeability, which creates an increase in irrigation efficiency (Bogatin et al., 1999). In addition to soil permeability, MW water interacts with the structural calcium in cell membranes, making the cells more permeable (Goldsworthy et al., 1999). The reduced surface tension observed in MW results in better infiltration of water and a reduction in water and chemical use. At the Indianapolis 500 Brickyard Crossing Golf Course a MTD has been installed to treat irrigation water. An improvement in the infiltration distribution of water has all but eliminated wet and dry area, reducing 80 hours of weekly hand watering to less than 10 hours a week (Ritchie & Lehnen, 2001). The improvement in uniformity distribution of irrigation water has saved money in labor, hand watering and roping off wet areas, and golf cart damage. Lin and Yotvat (1990) showed an increase in crop yield, size and sugar content of melon grown with magnetized irrigation water in South Africa. 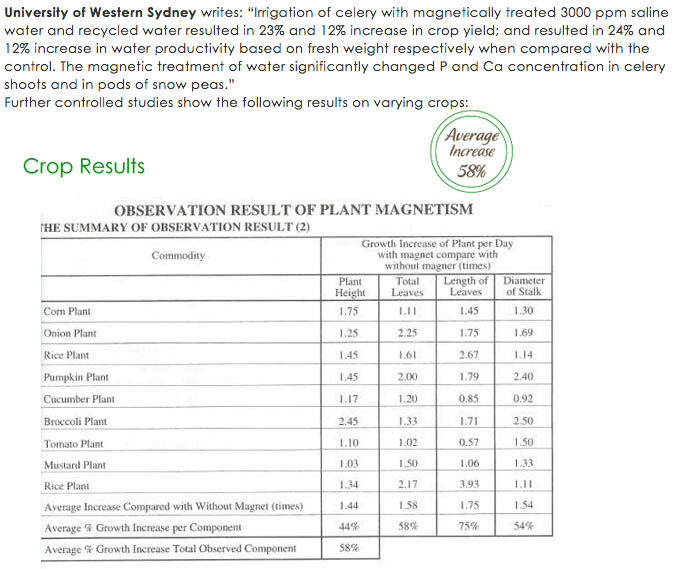 Maheshwari and Grewal (2009) reported statistically significant increases in the yield and water productivity of snow peas and celery, but no significant effect on the yield or productivity of peas. Harari and Lin (1989) conducted a study that showed the size of muskmelons, the number of fruits and their sugar content were significantly greater when irrigated with MW. Lentils irrigated with MW showed significant increase growth, the stimulation in growth is thought to be attributed to an effect of MW on the induction of cell metabolism and mitosis (Qados and Hozayn, 2010). Magnetized water has been reported to triple seedling emergence of wheat (Hilal and Hilal, 2000). Reina et al. (2002) reported a significant increase in the rate of water adsorption and an increase in total mass of lettuce when treated with magnetic water. Chickpea plants irrigated with magnetized water grew taller and heavier than plants irrigated with tap water (Hozayn and Qados, 2010). The authors attribute this stimulation to an increase in photosynthetic pigments, where the magnetic water induces cell metabolism and mitosis meristematic cells in pea, lentil and flax (Belyavskaya, 2001). Additionally, it is believed that new protein bands are formed in plants that are treated with magnetic water, and that these proteins are responsible for increased growth (Hozayn and Qados, 2010). MW has been linked to increases in photosynthetic pigments, endogenous promotors, total phenol and protein biosynthesis in plants (Qados and Hozayn, 2010 and Shabrangi and Majd, 2009). The application of a magnetic field has been shown to induce seed germination, and increase the percentage of germinated seeds. Carbonell et al. (2000) showed an increase of the germination rate and percentage of rice seeds treated with a magnetic field. Moon and Chung (2000) treated tomato seeds with a magnetic field and found that germination rates were accelerated about 1.1–2.8 times when compared to the control seeds. Pinus tropicalis, a tree species endemic to western Cuba, typically experiences a <50% germination rate, when seeds were treated with MW as part of a 2007 study, germination occurred in 70-81% of seeds (Morejón et al., 2007). Germination of broad bean seeds was found to take place 2-3 days earlier when seeds underwent magnetic treatment (Podleoney et al., 2004). But, all studies have not confirmed this increase; Govoroon et al. (1992) observed no effect of magnetic treatment on the growth of pea, flax, and lentil seeds. Dairy cows that drink magnetized water have shown an increase in milk production with the same amount of milk fat as present in cows drinking ordinary water. They also have a longer lactation period with fewer non-productive days and overall health is better (Lin and Yotvat, 1990). Levy et al. (1990) demonstrated that young male cattle watered with MW increased their dry feed intake, while improving their digestion and nitrogen retention. Piglets watered with MW drank twice as much water, and grew 12.5% larger than the control group (Kronenberg, 1993). Chickens watered with MW grew larger, with an increase in the meat to fat ratio, and experienced reduced mortality rates (Gholizadeh et al., 2008). Also, poultry have showed an increase in egg production when watered with MW (Lin and Yotvat, 1990). Globally millions of people drink MW as a “healing’ prophylaxis, despite little evidence to support or debunk the benefits of MW on health. In China the use of magnetic materials is a traditional remedy and is becoming more popular in modern medical science. Drinking MW has been reported to improve bladder problems, stroke recovery, arthritis pain and reduce blood pressure. But no systematic clinical trials have been completed to support or disprove these effects (Grusche et al., 1997). Thought to improve the bodily environment through the introduction of a magnetic field, it is believed that MW can strengthen the immune system, antioxidant activity and decrease blood viscosity, cholesterol and triglycerides (Dayong et al, 1999). Decreasing blood viscosity can keep blood flow rates at normal levels, preventing fats and plaque from accumulating on vessel walls and cell membranes. Oral irrigation with MW has been shown to greatly reduce supra-gingival calculus and plaque on dental patients (Watt & Rosenfelder, 2005). Those patients using the MW irrigator experienced a 44% reduction in calculus volume on their teeth compared to the control group. In tests on animals, Yue et al. (1983) reported a 70% cure rate in the treatment of urinary stones with MW and over 93.9% for salivary calculus. Magnetic water treatment directly influences the carbonate equilibrium in water, leading to the formation of calcium carbonate (CaCO3) particles in solution that then cannot precipitate on pipe walls and other equipment. Particles are carried downstream in pipe flow and are later removed with filtration. Patented in 1945 (Vermeiren) MW can be used to prevent and remove scale and is currently common global use of MW. Mineralized coatings inside pipes and water containers have been found to reduce with the use of a magnetized water system (Lin and Yotvat, 1990) like the Magnation Scale Reduction System. Barrett and Parsons (1998) attribute scale reduction to the effect of MW on CaCO3 particles by suppressing nucleation and accelerating crystal growth. The mechanics of how magnetic treatment interacts with calcium carbonate in solution is still unknown, and further investigation must be completed. In Gehr et al. (1995), the precipitation of CaSO4 was investigated and found that magnetic treatment induced precipitation of gypsum crystals (CaSO4 2H2O). But also found that if magnetic treatment were to be an effective treatment for scale prevention it would most likely reduce precipitation on solid surfaces and encourage crystallization. Additionally, Parsons et al. (1997) showed that solution pH is reduced by the introduction of a magnetic field, and that this change in pH directly affects scale growth. Magnetic water treatment for the prevention of scale is accomplished by passing water through a strong magnet that is installed on or in a feed line. Then when the water is later heated, either in a heat exchanger or a boiler, it has lost its tendency to precipitation scale onto the hot surfaces and the deposits that do form have a looser texture that is easily removed (Herzog et al., 1989). Parsons et al. (1997) showed a 48% reduction in scale using MW, and Busch (1997) recorded a 22% reduction. Figure 3. Results from Lipusa and Dobersekb, 2007. Picture (C) is a steel pipe with scale from untreated water; (D) is a similar pipe with little scale from magnetically treated water. Swimming pool water quality can be improved by the addition of a clamp on magnetic device on the circulation system. The magnetic device can prevent and remove scale build up at the water line in the pool and filtration system, and allow for chlorine levels to be reduced by one-half (Kronenberg, 1993). With an efficiency rating of 20-40%, clamp on magnetic treatment devices can remove old scale deposits and prevent the formation of new deposits (Kronenberg, 1993). The U.S. Department of Energy reported that a thin film (1/32in) of scale in a heat exchange surface can increase energy consumption by 8.5%, and scale of up to 1/8in increases energy consumption by 25% (U.S. DOE, 1998). It was estimated that scale removal in Britain cost £ 1billion/year in the early 1990’s (Smith, 2003). The installation of magnetic treatment devices for water softening equipment for the removal or prevention of scale has been shown to generate significant energy savings, even with the initial capital to invest in the technology. Magnetic water treatment, like the Scale Reduction System, creates additional collisions of ions that precipitate CaCO3, and it changes the free gas content in water that leads to improved crop yields. These mechanisms create many applications for the use of MW, with the use of MW having the potential to become more commonly used in the irrigation of crops, as drinking water for livestock and to prevent and remove scale buildup in hydrologic infrastructure. With many studies showing increases in crop yields and healthier animals as a direct result of using MW, the science behind magnetic treatment is still poorly understood. There are many scientific journal articles that have reported positive effects of using MW, but reported results often have low reproducibility and inconsistences. It's best for farmers to try the technology on their irrigation system and see the results based on their unique variables. It is worth noting that as a result of the high-energy reactions that take place when making MW, free radicals, atomic oxygen, peracids, ozone and nitrogen containing compounds are formed (Bogatin et al., 1999 and Colic and Morse, 1999). Regardless, MW treatment is considered to be a green technology with a strong power of transmission. Magnetic treatment technologies can reduce energy consumption, chemical resources, and water usages leading to cost savings and environmental improvements. Devices for creating MW is generally compact, with permanent magnets that are clean and safe technology (Otsuka and Ozeki, 2006). Water productivity can increase with the use of MW water, due to improved infiltration. With greater crop yields when MW is used for irrigation, less total water is used per unit of yield. In arid regions with limited water, MW may become popularized for irrigation water for certain crops and livestock. By Dr. Klaus Kronenberg, Ph. D.
Water is the most necessary substance for life. In fact, living creatures — like spas and pools are basically vessels for liquid water. Because we work in an industry that relies so heavily on sanitized water, it is imperative that we strive to understand how water reacts under various conditions. This is not always an easy task, as liquid water refuses to follow some of the most fundamental laws of nature. It is the one substance that turns into something lighter when it crystallizes-which is why ice floats. And even when liquid water cools down to near freezing it violates one of the basic rules that heat rises and expands things. As water cools down below 39 degrees Fahrenheit, it does not shrink, it expands! It expands so much that the coldest water moves to the top, above warmer water! That’s why freezing starts on the top of the water. We should be happy it does that. Because of this solid layer of water on top, the rest of the water is insulated. Another weird water fact is that it accepts more heat energy than its normal share-a great benefit to life. Indeed no other substance can transport as much heat energy. That’s how liquid water normalizes the temperature extremes in out living zones-it absorbs heat when there is too much, and it releases heat if there is not enough. The list of the anomalies in the behavior of liquid water could be continued on and on. But we have to consider one more: Although water, chemically neutral, it is one of the best solvents known to man. Water has the capability to entrap other substances. In other words, it tends to cluster around every non-water particle, forming conglomerations or complexes, as they are called scientifically. Water’s capacity to entrap substances results in its high mineral content. The amount of these dissolved minerals being carried by the water determines its hardness. One of the most common minerals in water is calcium carbonate, a substance that forms mountain ranges such as the Alps. When liquid water evaporated the dissolved minerals become over concentrated and must crystallize. This also happens when the temperature of the water increases, or when the solubility of the carbonates in the water decreases. The consequence is a sediment of those minerals on the walls of the container — in our case spas and pools. These sediments of minerals that grown on the container walls are actually limestone, which is hard and difficult to remove. Very hard water can produce these hard sediments with bad consequences. Unfortunately, this process is a slow one and cannot be recognized immediately. Nevertheless, the effects of hard water are quite noticeable if left to build up over time. Today the water lines that the Romans had used for hundreds of years show accumulations of hard lime scale many inches thick, as in the beautiful Pont du Gard in southern France, for instance. But it only takes a few years for hard lime scale to take its toll on water pipes and equipment. Such sediment layers in heaters hinder the transfer of heat. For swimming pools, the removal of existing hard lime scale is usually accomplished by an acid wash, which interrupts the operation of the system. Furthermore, the acid can attack pool walls and open up leaks. Most water supplied by water districts in the United States is well cared for, analyzed chemically and rendered clean enough for drinking. Most of it contains a good amount of calcium content. This is important for proper taste and a healthy mineral balance. However, it tends to create deposits of scale over the years if no preventative measures are taken. Preventing scale can also be accomplished via water softeners, which work as ion exchangers. They take the calcium carbonate and replace it with sodium. The resulting water is not recommended for drinking because of the sodium content. And used in larger amounts, it also adds salt to the groundwater. Other chemical additives may rid the water of calcium carbonate, but only by risking contamination. If one is serious about finding a cure for an undesired condition, it is essential that he or she find out what the source of the problem is. In the case of hard lime scale, the reason for it’s formation is easy to understand with a few basic laws of crystallography. The change from the dissolved calcium carbonate to lime scale is a phase change from liquid to crystalline. Any phase change needs a starting point. Most of the time a piece of a different material may serve as such a starting point. Such a piece can be extremely small, like a speck of dust, a super molecule or tiny solid particle. If such starting points are not available in the water, the crystallization can start only at the materials that make up the container walls. The crystallization grows in layers until it becomes lime scale. Fig. 1, Microscopic photograph of unconditioned hard water showing “dendritic” crystal scale formation. Fig. 2, The same water as in Fig. 1 after having moved through magnetic fields with nearly 100% effectivity. Once we know what causes lime scale, the means of prevention seem obvious. We have to provide the necessary crystallization points for the minerals in the water so that the minerals do not wander to the container walls to find crystallization points. How can we do that? By creating a disturbance in the water that produces crystallization centers for the minerals. Actually, most water contains huge amounts of such centers. Almost all of these potential centers however are entrapped by the water-molecule complexes and cannot act as crystallization centers. Therefore, we have to break a few of these complexes so that their internal captive particles become free. Once free, they act as centers for mineral molecules and form microcrystals. That leaves less calcium carbonate to form hard scale on the walls. Fortunately, an entire arsenal of complex-busting techniques is available. The disturbance can be mechanical whirling, sonic disturbance, electrical frequencies and magnetic disturbances. They all reduce the formation of hard lime scale to some extent. Lately, magnetic devices have become more and more popular for a number of reasons. Permanent magnet materials have been developed in recent decades to be 100 times as strong and much more durable then the old-fashioned magnets made out of steel. In contrast to steel magnets, which weaken with age, modern ceramic magnets do not show any changes with age. They keep their forces so precisely stable that nuclear submarines base their subpolar, under-ice navigation on instruments depending on the accuracy of the permanent magnets. So, once they are magnetized, permanent magnets never need recharging or an energy source, which makes their use most convenient and unfailing. The effects of magnetic fields on running water have been observed long before these better magnets were developed. Patents on treatment of water with magnets appeared as early as the 1950s. Though these magnets were not very strong, their effects were described as making the water appear to behave as if it was soft, as if its mineral content was lowered. Noticeably less scale was produced after prolonged use. Lacking any chemical means of softening the water, these countries used magnets to treat water for irrigation and industrial uses, as well as for personal use, where improvements of taste and faster drying were reported. Many attempts to explain the reasons for the observed effects were made without much success. Also methods of measuring the effects remained unsatisfactory. In western countries the use of magnetic water treatment methods developed much more slowly. Water softening by chemical means was in general use and the difficulties of explaining and measuring magnetic effect on flowing water kept it suspect in western minds. In addition the chemical industry tried to discourage its utilization for obvious reasons. However, the practical effects of magnetic water treatment were undeniable after prolonged use. A number of companies took advantage of the situation in western countries to market magnetic devices for water treatment, often equating magnets with magic or mysticism. But there is no mystique in how magnets work to treat water problems. For example, the agriculturally oriented California State Polytechnic University in Pomona, Calif., Pioneered the reuse of irrigation water by using magnetic water treatment devices. 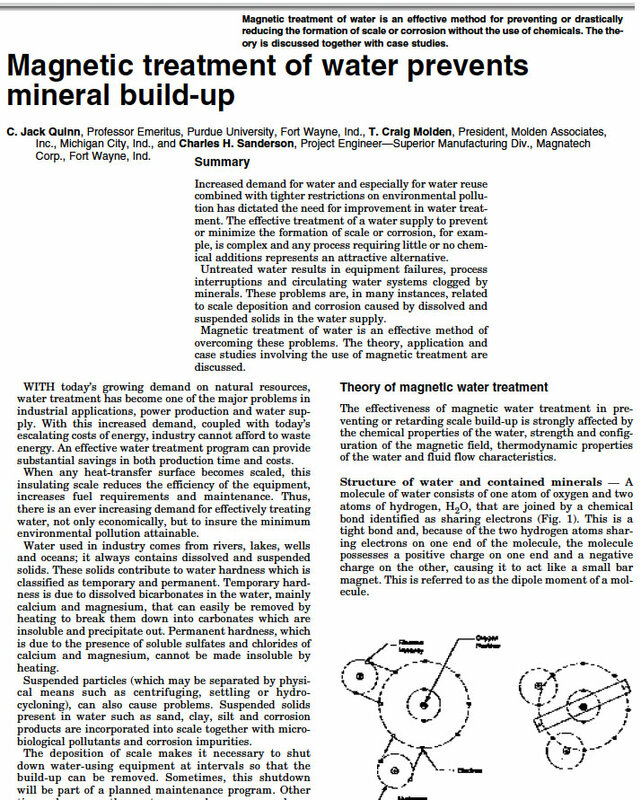 The positive effects of magnets on water was confirmed in the 1980s through systematic research. With the scientifically sound knowledge of the processes involved, it was then possible to develop treatment devices with the newest permanent magnets. Also a quantitative method evolved for evaluating the effectiveness of the devices. The new devices had a great effect on water treatment. Not only was the formation of scale totally eliminated, the removal of scale deposits in old water pipes could be accomplished in relatively short times. This had taken years with the older devices. How can magnets do that? How can they provide nucleation centers in the water? The shortage of nucleation centers in the water is known to inhibit the capability of the water molecules to cluster around each foreign particle, rendering it unavailable as a nucleation center. The forces of the magnetic fields on those water molecule clusters is very weak. However the clusters vibrate in a number of ways. When they pass a number of magnetic poles at a certain velocity the periodic changes of the magnetic fields may coincide with one of the internal vibration frequencies of the water cluster. Resonance may occur and result in cracking open such a cluster. The formerly entrapped particle is set free, and the nearby mineral molecules rush from all sides to their nucleation center, where they form platelets. container wall. In turn, the number of hard crystals is reduced accordingly. This percentage reduction is the magnetic treatments effectiveness rating. Since a method of quantitatively determining the effectiveness of the magnetic devices was developed, manufactures have been able to maximize their efficiency for industrial and residential use. Dr. Klaus J. Kronenberg is a world-renowned physicist specializing in the study of permanent magnets. Hard lime and scale forms where ever tap water evaporates or is heated. While it may not be noticeable for a long time, there are commercial appliances that show a white deposit after only a few days of use. Steam cleaners, for instance, may become inoperable after two weeks due to heavy scale deposits. They have to be washed often with acid in order to avoid filter clogs. Also, dishwashers in restaurants need to be freed from the white scale deposits regularly. In the average residential home, it may take a couple of years until a layer of hard scale reduces the cross section of water pipes significantly. And in swimming pools a rough band of sediment often develops along the waterline, which may require mechanical grinding to be removed. In many cases where the water has a high iron content, the scale deposits develop brownish tint. They may even acquire a deep brown color, as is often evident in toilet tanks. In dairy operations, fatty substances often mix with the sediment and create “butter stone.” In regards to cooling towers, circulating water may mix with algaecides, and the ensuing deposits may be toxic. These examples indicate that lime scale may contain more then calcium carbonate. Other minerals dissolved in the water solidify, as well, and can produce unsightly or even dangerous substances. Fortunately, a well designed magnetic treatment device will prevent such deposits from developing, as long as it is sized for the maximum water flow capability of the particular plumbing system. Safety inspections may be required, but in most cases inspection reveals nothing more than and accumulation of sludge, which can be removed easily. Recently, a pool builder inspected my 30 -year-old pool, which has been fitted with simple magnetic water treatment device that is clamped on one of the lines between the pump and the filter. He was astonished to feel not a trace of roughness on the waterline tiles, and he could hardly believe that we did nothing to clean the tiles since last summer. During the resurfacing of my driveway, a small bulldozer happened to rip one of the feed lines for the lawn sprinklers out of the ground. A young plumber replaced the old galvanized iron piping with new PVC tubing. The next day he returned and asked my permission to saw off a little piece of the old pipe. The reason: He wanted to show his father, a long time plumber, that it was possible for the outside of a water pipe to accumulate a thick crust of rust deposits while the inside of the 30-year-old pipe was without any substantial deposits. But how could the old water tubes of my sprinkler systems be free of the interior deposits? After all, these tubes had been in the ground for 18 years before I had magnetic water treatment device attached to the house’s water supply line. At that time lumpy hard deposits of reddish brown stones had already reduced the inner diameter of the 1-inch piping to less than 3/4 inch. The removal of these hard deposits was rather dramatic. On Feb. 28 1982, when the magnetic device was installed on my house, I had opened all the faucets, toilet flushers, drains and garden hose outlets. Soon I found it necessary to remove all faucet strainer heads because the brown water emerging carried lumps of brown matter with it. It took about 4 hours until the emerging water had become colorless and ran steadily. This event can be explained using the same facts about crystallization in water that were detailed in part one of this column. The only difference between magnetically treated water and untreated water is that magnetically treated water enables minerals to crystallize in the water instead of on the surface of some pipe or container. As a result we have converted the water formerly saturated with dissolved minerals into a mixture of solid microcrystals and clean water. When this purified water flows past other minerals it is capable of dissolving a new load of minerals. split the crystalline matter from the container wall. The dramatic speed of this process made some precautions necessary. In order to avoid clogs, filters and strainers should be temporarily taken out of the circulation system. Clamp-on magnetic units typically have an efficiency rating off 20 to 40 percent although they are capable of removing old lime scale, this may take several weeks. But because they also prevent the formation of new scale, the units are always producing some benefit. Corrosion prevention is another benefit of magnetic water treatment. Periodic acid washing of a pool is one of the reasons for the metal corrosion. In some cases, after long periods between acid washings, the hard deposits may cover up some weak spots, which turn into leaks when the deposits are dissolved by the next acid wash. Because magnetic water treatment makes acid washes unnecessary, a major cause of corrosive damage is eliminated. Also after a long period of magnetic water treatment, the interior of pipes becomes covered with a thin continuous coating. This layer does not change over the years. Analyzed by a number of scientific institutes, it has been determined to be a corrosion preventing inert substance. In one case, it was found to be aluminum silicate. The Steinbeis Institute in Reutlingen, Germany, has devoted years of research to the study of corrosion and has published numerous articles outlining the corrosion reduction experienced with water systems treated with magnetic devices. Effectively treated water looks sparkling clear, even if the water supply is murky. Some water experts claim they can recognize a specific silky appearance of magnetically treated water. This might be due to the multitude of microcrystals, which can reflect sunlight. The developing microcrystals, however are so small that they are visible only with high magnification. In regards to smell, water that comes with a slight sulfur odor loses this smell after being treated with magnetic devices. Of significant interest to this industry, the chlorine odor of chlorinated water is greatly reduced by effective magnetic treatment. In fact, slight chlorination may become unnoticeable to the average user. For aromatic brews such as teas or coffees, the desired aromas can be achieved with fewer ingredients if the water is effectively treated. The ensuing aromas appear cleaner to perceptive noses. It is said that in some eastern countries — China for instance — many people heat their tea water in a pot containing a magnet. One of the most obvious effects of magnetic water treatment is the enhanced ability of most cleaning chemicals and detergents. Magnetically treated water increases their effectiveness to the point where just one-third or even one-fourth of the cleaning agent is needed. In the cases of naturally contaminated water from lakes, an intense magnetic treatment has made the lake water fit for human consumption. Magnetically treated water runs off a cleaned surface faster and in thinner sheets because surface tension is reduced. As a result one sees fewer water spots from drying. This has been applied successfully for the watering of decorative plants by sprinklers. Surface tension in water is critical to biological life. Surface tension makes water rise in the fibers of the plants. It fills the capillaries in your body and it determines water’s ability to penetrate soil and other materials. Therefore it is not surprising that wherever magnetic water treatment has been practiced, growth patterns have changed. Experiments with groups of growing farm animals and agricultural plants have been conducted at universities and federal institutions with stunning results. Some were hard to believe, so the scientists were reluctant to publish them immediately, pending confirmation. At a California university, two control groups of piglets of 24 piglets each with normal feeding were compared with two groups of 24 piglets that were getting their water from a magnetic treatment device. The latter groups consumed twice as much water and grew an average 12.5 percent faster. Cotton plantings with various irrigation were compared in California. The cotton plants irrigated with magnetically treated water grew to larger sizes with larger and denser foliage. However, they produced one-third less cotton than the control plantings. A Washington navel orange tree watered with the magnetically treated water carried less fruit, but each orange became unusually thick and juicy, weighing 20 ounces on average. Similarly, a Eureka lemon tree fed magnetically treated water carries lemons that grow up to one pound each. One biologist suggests that the slightly reduced surface tension of the magnetically treated water may facilitate its penetration of cell walls. This could accelerate the normal dividing of the cells in growing parts of living individuals. This would account for the faster vegetative growth and the reduced reproductive cell division responsible for the number of flowers and fruit. to ingest their food directly through their cell wall. They get plenty of water through it, but they cannot receive any nourishment in the form of crystallized minerals, which cannot penetrate the cell walls. Thus, bacteria in magnetically treated water starve. Observations on swimming pools confirm this effect. The normal chlorine content of treated of swimming pools can be reduced by at least half if the water is efficiently magnetically treated. Even without any chlorination , no algae growth can be detected for about 36 hours. 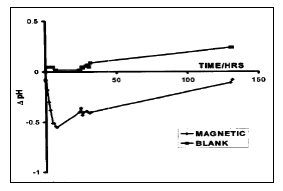 This is the normal duration of the affectivity of the magnetic treatment. After one to two days, the microcrystals formed by the treatment start to redissolve. After this time, a vigorous growth of algae occurs in the non-chlorinated pool if it is not replenished with treated water. Chlorine content can be reduced by at least half, and chlorine odor is further reduced because much of the chlorine is incorporated into the microcrystals,which we cannot smell. The treated water does not produce sediments on the pool’s waterline. No hard lime scale develops in the circulation system — neither in the filter nor in the heater. The application of a magnetic field has been shown to induce seed germination, and increase the percentage of germinated seeds. Carbonell et al. (2000) showed an increase of the germination rate and percentage of rice seeds treated with a magnetic field. Moon and Chung (2000) treated tomato seeds with a magnetic field and found that germination rates were accelerated about 1.1–2.8 times when compared to the control seeds. Germination of broad bean seeds was found to take place 2-3 days earlier when seeds underwent magnetic treatment (Podleoney et al., 2004). Carbonell, M.V., E. Martinez, J.M. Amaya. 2000. Stimulation of germination in rice (Oryza sativa L.) by a static magnetic field. Electro-Magnetobiol, 19(1):121-128. Magnetized water has been reported to triple seedling emergence of wheat (Hilal and Hilal, 2000). Reina et al. (2002) reported a significant increase in the rate of water absorption and an increase in total mass of lettuce when treated with MW. Chickpea plants irrigated with MW grew taller and heavier than plants irrigated with tap water (Hozayn and Qados, 2010). The authors attribute this stimulation to an increase in photosynthetic pigments, where the magnetic water induces cell metabolism and mitosis meristematic cells in pea, lentil and flax (Belyavskaya, 2001). Additionally, it is believed that new protein bands are formed in plants that are treated with MW and that these proteins are responsible for increased growth (Hozayn and Qados, 2010). MW has been linked to increases in photosynthetic pigments, endogenous promotors, total phenol and protein biosynthesis in plants. (Qados and Hozayn, 2010 and Shabrangi and Majd, 2009). Magnetic treatment directly influences the carbonate equilibrium in water, leading to the formation of calcium carbonate (CaCO3) particles in solution that then cannot precipitate on pipe walls and other equipment. Patented in 1945 (Vermeiren), MW can be used to prevent and remove scale and is currently common global use of magnetized water. Barrett, R. A. and S.A. Parsons. 1998. The influence of magnetic fields on calcium carbonate precipitation. Water Res., 32: 609-612. U.S. Department of Energy. 1998. 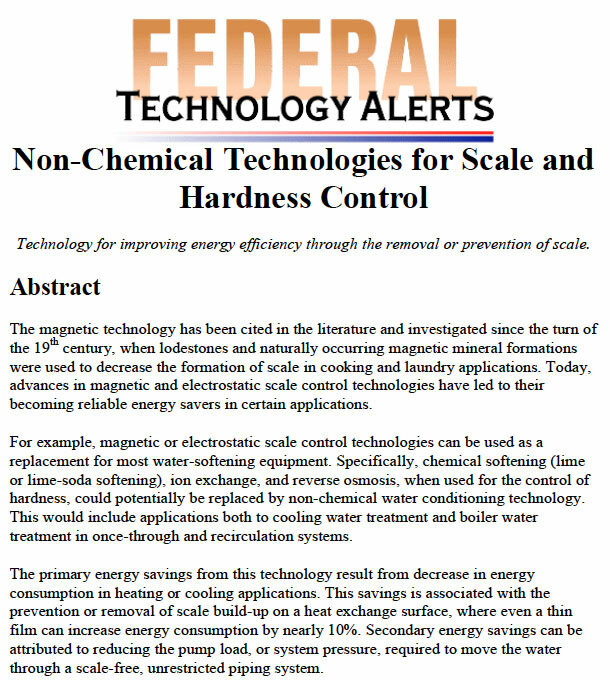 Federal Ttechnology Alert Non-Chemical Technologies for Scale and Hardness Control. DOE/EE-0162, U.S. DOE Pacific Northwest National Laboratory, 22pp. Busch K.W. and M.A. Busch. 1997. Laboratory studies on magnetic water treatment and their relationship to a possible mechanism for scale reduction. Desalination, 109(2):131-148. Herzog, R.E., Q. Shi, J.N. Patil and J.L. Katz. 1989. Magnetic water treatment: The effect of iron on calcium carbonate nucleation and growth. Langmuir, 5: 861-867. Dairy cows that drink MW have shown an increase in milk production with the same amount of milk fat as present in cows drinking ordinary water. They also have a longer lactation period with fewer non-productive days and overall health is better (Lin and Yotvat, 1990). Levy et al. (1990) demonstrated that young male cattle watered with MW increased their dry feed intake, while improving their digestion and nitrogen retention. Piglets watered with MW drank twice as much water, and grew 12.5% larger than the control group (Kronenberg, 1993). Magnetic treatment of saline irrigation water can be used as an effective method for soil desalinization. The application of a magnetic field on water decreases the hydration of salt ions and colloids, having a positive effect on salt solubility, accelerated coagulation and salt crystallization. Field experiments showed that, sandy loam soil pots irrigated with normal highly saline water of an electrical conductivity value of 8.2 mmohs/cm retained salts compared to pots irrigated with magnetized saline water. The study showed that MW increased leaching of excess soluble salts, lowered soil alkalinity and dissolved slightly soluble salts (Hilal and Hilal, 2000). Belyavskaya, N.A. 2001. Ultrastructure and calcium balance in meristem cells of pea roots exposed to extremely low magnetic fields, Adv. Space Res., 28:645–650. Busch K.W., M.A. Busch, D.H. Parker, R.E. Darling and J.L. McAtee Jr. 1985. Laboratory studies involving magnetic treatment devices. Corrosion 85, NACE Houston Paper No. 251. Chang, K. and C. Weng. 2006. The effect of an external magnetic field on the structure of liquid water using molecular dynamics simulation. Journal of Applied Physics,100. Dayong, L., W. Shen, C. Jingyi, L. Tingren, C. Baoyi and F. Zhiyu. 1999. Effect of Magnetized water on the mice given high doses of antineoplastic drugs. Journal of Shanghai University 3(1): 81-83. Duarte Diaz, C.E., J.A. Riquenes, B. Sotolongo, M.A. Portuondo, E.O. Quintana and R. Perez. 1997. Effects of magnetic treatment of irrigation water on the tomato crop. Hortic. Abst., 69:494. Ellingsen, F.T. and H. Kristiansen. 1979. Does magnetic treatment influence precipitation of calcium carbonate from supersaturated solutions? Vatten, 35:309-315. Gehr R., Z.A. Zhai, J.A. Finch and S.R. Rao. 1995. Reduction of soluble mineral concentrations in caso4 saturated water using a magnetic field. Wat. Res., 29(3): 933-940. Ghauri, S. A. and M.S. Ansari. 2006. Increase of water viscosity under the influence of magnetic field. Journal of Applied Physics, 100. Gholizadeh, M., H. Arabshahi, M. Saeidi, B. Mahdavi. 2008. 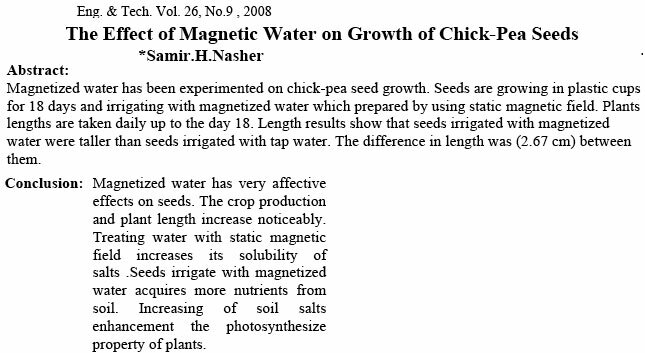 The effect of magnetic water on growth and quality improvement of poultry. Middle-East Journal of Scientific Research, 3(3):140-144. Govoroon, R.D., V.I. Danilov, V.M. Fomicheva, N.A. Belyavskaya, Zinchenko, S. Yu. 1992. Effects of fluctuations of a geomagnetic field and its screening on early phases in development of higher plants. Biofizika, 37:738–743. Grusche, S. and Z. Rona. 1997. Encyclopedia of natural healing: A practical self-help guide. Alive Books. Hozayn, M.; Qados, A.M.S.A. 2010. Irrigation with magnetized water enhances growth, chemical constituent and yield of chickpea (Cicer arietinum L.). Agriculture and Biology Journal of North America, 1(4):671-676. Joshi K.M. and P.V. Kamat. 1966. Effect of magnetic field on the physical properties of water. J. Ind. Chem. Soc., 43: 620-622. Kronenberg, K. 1993. More alluring facts about treating water with magnets. Aqua Magazine, September 1993. Lin I.J. and J. Yotvat. 1990. Exposure of Irrigation and Drinking Water to a Magnetic Field with Controlled Power and Direction. Journal of Magnetism and Magnetic Materials, 83: 525-526. Lipusa,L. and D. Dobersekb. 2007. Influence of magnetic field on the aragonite precipitation. Chemical Engineering Science, 62: 2089 – 2095. McMahon, C. 2009. Investigation of the quality of water treated by magnetic fields. University of Southern Queensland Faculty of Engineering and Surveying. Undergraduate thesis. Moon J.D. and H.S. Chung. 2000. Acceleration of germination of tomato seed by applying AC electric and magnetic fields. J. Electrostatistics, 48:103-114. Morejón, L.P., J.C. Castro Palacio, L. Velázquez, and A. P. Govea. 2007. Stimulation of Pinus tropicalis M. seeds by magnetically treated water. Int. Agrophysics, 21:173-177. Otsuka, I. and S. Ozeki. 2006. Does magnetic treatment of water changes its properties? J. Phys. Chem., 110(4):1509-1512. Parsons, S.A., B.L. Wang, S.J. Judd and T. Stephenson. 1997. Magnetic treatment of calcium carbonate scale – effect of pH control. Wat. Res., 31(2):339-342. Podleoney, J., S. Pietruszewski, and A. Podleoena. 2004. Efficiency of the magnetic treatment of broad bean seeds cultivated under experimental plot conditions. Int. Agrophys. 18:65-71. Qados, A. and M. Hozayn. 2010. Magnetic Water Technology, a Novel Tool to Increase Growth, Yield, and Chemical Constituents of Lentil (Lens esculenta) under Greenhouse Condition. American-Eurazian J. Agric. and Environ. Sci., 7(4): 457-462. Renia F.G., L.A. Pascual, I.A. Fundora 2001. Influence of a Stationary Magnetic Field on water relations in lettuce Seeds. Part II: Experimental Results. Bioelectromagnetics, 22:596-602. Ritchie, I. and R. Lehnen. 2001. Magnetic conditioning of fluids: an emerging green technology. 5th Annual Green Chemistry and Engineering Conference, June 26-28, 2001. National Academy of Sciences, Washington, D.C.
Shabrangi, A. and A. Majd. 2009. Effect of Magnetic Fields on Growth and Antioxidant Systems in Agricultural Plants. PIERS Proceedings, Beijing, China, March, 23-37. Shercliff, J.A. 1965. A Textbook of Magnetohydynamics. Pergamon Press, New York. Smith,C., P. Coetzee and J. Meyer. 2003. The effectiveness of a magnetic physical water treatment device on scaling in domestic hot-water storage tanks, Water SA, 29(3). Watt, D. and C. Rosenfelder. 2005. The effect of oral irrigation with a magnetic water treatment device on plaque and calculus. Journal of Clinical Periodontology, 20(5): 314-317. Yue, Y. W. Huaxiang, X. Wenhui, Z. Xiehe, M. Dingxiang, M. Tingjie and L. Su. 1983. Studies on the effect of magnetized water in the treatment of urinary stone and salivary calculus. Proceedings of the 7th International Workshop on Rare Earth-Cobalt Permanent magnets and their Applications. Optimal healthy DNA is surrounded, and fully hydrated, by a matrix of water that is structurally different from tap water. Under high powered microscopes, the water, when frozen, forms six sided, hexagonal shaped, ring structures. These were determined to receive and transmit electromagnetic energy, that is, frequency vibrations that power every cell function and structure. Magnets affect the bonding angle between the hydrogen and the oxygen atom in the water molecule. Magnetized water causes the hydrogen-oxygen bond angle within the water molecule to be reduced from 104 to 103 degrees. This in turn causes the water molecule to cluster together in groups of 6-7 rather than groupings of 10-12 and higher. The smaller cluster leads to better absorption of water across cell walls. Dr. Michael Lam, MD in his study on magnetized water, reports that there have been numerous reports from those drinking magnetized water on a daily basis of people being cured of many chronic degenerative disease such as renal stones and arthritis. Magnetic water (MW) is water that has been passed through a magnetic field. Magnetic water treatment devices (MTDs) are environmentally friendly, with low installation costs and no energy requirements. MW can be used to increase crop yield, induce seed germination and benefit the health of livestock. MW treatment is currently used in Australia, Bulgaria, China, England, Japan, Poland, Portugal, Russia, Turkey and the United States for these purposes (Qados and Hozyan, 2010 and Hozayn and Qados, 2010). It is believed that MW used for irrigation can improve water productivity (Duarte Diaz et al., 1997), thus conserving water supplies for the expected future global water scarcity. MW has also been found to be effective at preventing and removing scale deposits in pipes and water containing structures. Magnetically treated water also can increase the levels of CO2 and H+ in soils comparable to the addition of fertilizers. Cleaning agents have an increased effectiveness when combined with the power of MW, and the amount of cleaner used can be reduced by one-third to one-fourth (Kronenberg, 1993). - IS THE WORLDS MOST POWERFUL MAGNETIC WATER TREATMENT DEVICE. "Magnetised water - in TodayTonight (Australia). 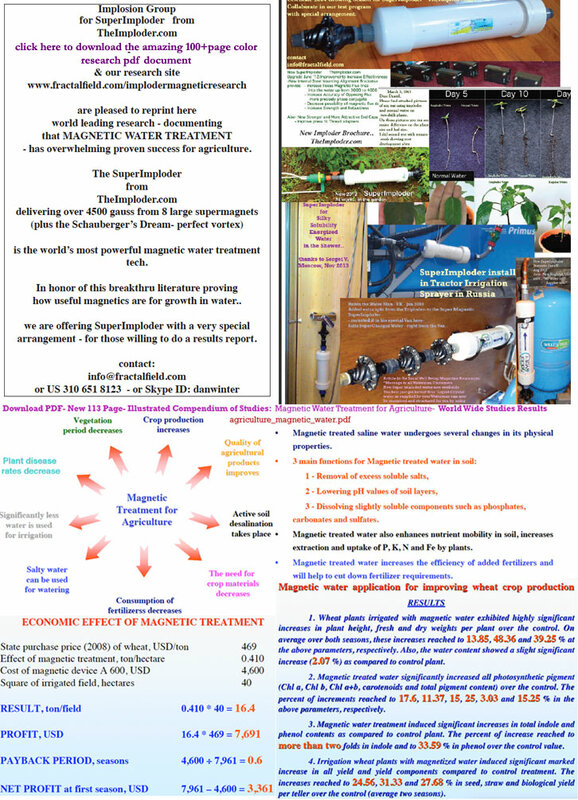 The use of magnetic water in agriculture to increase harvest and save up to 25% water. Live testimonials by biggest Australian farmers"
Abstract Observable changes of water by magnetic fields have been investigated in an attempt to contribute to the knowledge of the structure of liquid water. The crystallization mode of the water's mineral content was found to change from a dendritic, substrate-bound solidification habit to the form of separate disc-shaped crystals after the water had moved through a number of magnetic fields. The former scarcity of crystallization nucleii in the water had been turned into an abundance of nucleation centers in the water. The reduction of the number of the substrate-bound crystals has been used as a quantitative measure of the magnetic effect. A mechanism is suggested assuming that resonance between the time sequence of the magnetic fields and the internal vibratory frequency of the water complexes results in the fracture of some of the complexes. Thereby, the formerly encased foreign particles are released and provide the nucleii for the formation of disc-shaped crystals throughout the volume of the water. Further studies are urged in view of the staggering potential benefits for many water users, such as prevention of hard lime scale build-up, increased effectivity of chemical additions to water for softening, fertilizing, feeding, and cleaning purposes. also US Federal Reseach showed- strong magnetic field treatment of water- eliminated need for water softener and decrease pipe build up/ scaling.